I was out for coffee with a friend on Tuesday, and he mentioned that he’d read somewhere that the ‘Dark Ages’ were a creation of the Enlightenment. I can’t speak to the history of that term exactly, although ‘Middle Ages’ is a term created by the Renaissance. The question does arise as to the aptness or truth of such a name. First, we have to say that it is by no means apt for the entire Middle Ages. If it is ever useful, it cannot be seen as holding meaning for the period of the later eleventh century and beyond. I find it hard to place Lanfranc and Anselm in a ‘dark age’, let alone Durham Cathedral. The twelve-century Renaissance, with its flowering of Latin poetry, developments in visual arts, the birth of Gothic architecture, the rise and organisation of the universities, the great Cistercian spiritual masters, the early scholastics. So the Dark Ages must be before that, if they exist. If any age is ‘dark’, the argument will have to be made about the decline in material comfort and cultural production attendant upon the fall of the Western Roman Empire. Long-distance Mediterranean trade ceased. Cattle got smaller. Pottery got worse. Western European cities grew smaller, as well. Fewer people were literate. There was a lot of small-scale, continual warfare in many places. If — I repeat the conjunction, if — we are looking for the Dark Ages, they will be here. As soon as I say that, though, I don’t like it. What of Boethius, Venantius Fortunatus, Maximus the Confessor, and Bede for pity’s sake? 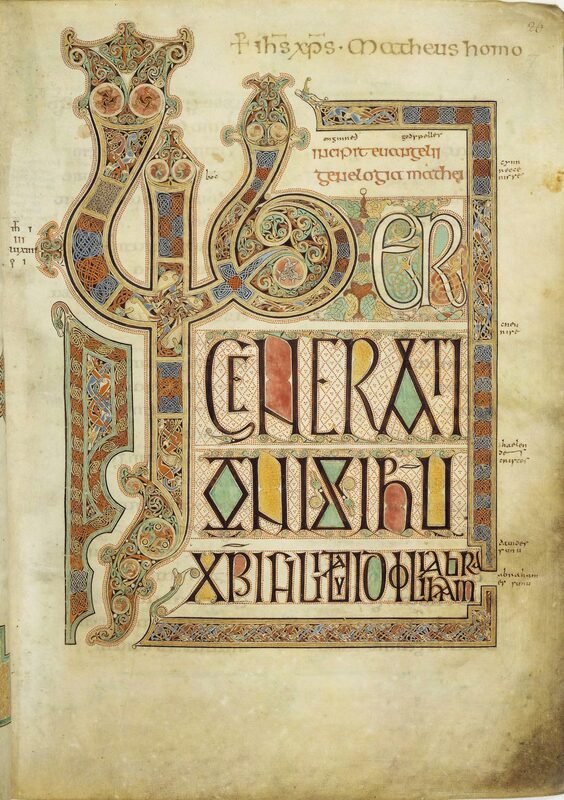 What of the Book of Kells and the Lindisfarne Gospels? What of the early mediaeval churches still standing in various Italian cities? What of Sutton Hoo? And what about the Carolingians? Sure, their cultural programme may not have reached as far or long as desired, but lay literacy seems to have increased, along with manuscript production and other artistic goods associated with the Carolingian Renaissance? Of course, the Carolingians coincide with Viking raids from the North and Saracen (Arab?) raids from the South for western Europe. But even then, political instability and death by the sword are a mainstay for most of European history. The ninth century is a wonderful example of bleakness alongside vitality. Vikings raid Lindisfarne in 793. Alfred commissions the Old English translation of Boethius several decades later. The realities of history as we know them, and even as they were experienced, should make us eschew such terms as ‘Dark Ages’, because as soon as we have enough knowledge to give life nuance, things aren’t always as dark and bleak as we thought, even if we have to admit that they were sometimes pretty bad. This entry was posted in Christianity, History, Mediaeval, Monks and Monasticism and tagged bede, boethius, carolingian renaissance, fall of the roman empire, maximus the confessor, the dark ages never happened, the renaissance never happened, twelfth century, venantius fortunatus, what are the dark ages on November 22, 2018 by MJH.